The "flower ghoul" was my 10-year-old stepdaughter. Source Her dress was a child's Halloween costume pattern (Rose from the movie "Titanic"), done in our wedding colors of black and scarlet. 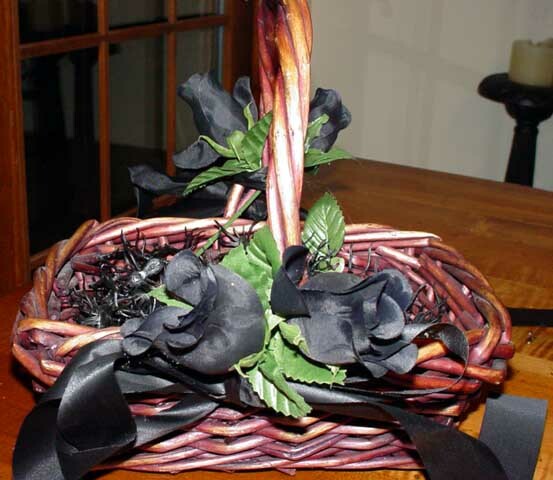 Project She carried a basket decorated with black silk roses and black ribbon. Instead of rose petals, she strewed plastic spiders. Give your ringbearer a unique pillow. See the Projects section for some suggestions. Instead of the traditional rose petals, the flower girl might strew confetti in Halloween shapes (such as that found at stationery stores), pumpkin seeds, or autumn leaves. Dress your flower girl as Wednesday Addams and your ringbearer as Pugsley. Your ringbearer might add an adorably gothic touch dressed as a vampire.